DokaXact is the first wireless interactive sensor-based system, enabling high level accuracy of positioning wall formwork elements for vertical structures, such as high-rise concrete cores. DokaXact is used with climbing systems and supports construction site crews to quickly and precisely plumb and align wall formwork. It consists of a centralised processing unit, which communicates wireless with multiple sensors and the DokaXact app. The system accuracy of ± 2mm allows maximum precision in positioning formwork elements. The DokaXact system contributes to an accelerated execution of formwork operations and concrete works - an important step forward in smart construction sites. The DokaXact system is another step towards digitalising the construction site processes. It ensures labour efficiency and more certainty of deadlines and costs. By creating efficient operations, increased productivity and higher quality of execution, the DokaXact system becomes a valuable tool for site crews working on construction jobs in the sectors high rise, infrastructure and energy. What components comprise the DokaXact system and how does it work? The DokaXact system is suitable for multiple sectors in the construction business. It is primarily used in high rise applications, however it is also suitable for vertical structures in infrastructure and energy projects. DokaXact is the result of in-depth analysis of construction-site processes, taking the needs of the users on-site into consideration. The primary goal of the development team was to create a system which accelerates the proceedings of forming, reinforcing and pouring within the predefined structural tolerance, in a higher quality. In addition, creating transparency of these processes for all stakeholders was considered another key factor whilst developing the system. Check out what our customers and in-house experts have to say about DokaXact. “The indispensable feature is for sure the accuracy of the element we are casting, being able to monitor it, before-during-and after the pour. It allows you to oversee the whole process from start to finish, to make sure that it is cast within the designed position, and there are no errors." "The benefits of DokaXact is to aid the carpenters on the site, to align the formwork, without the use of the engineer, because basically on large cores, you could use up to 3 or 4 engineers to plumb the formwork, but this can be done by one single person using a hand operated mobile phone." 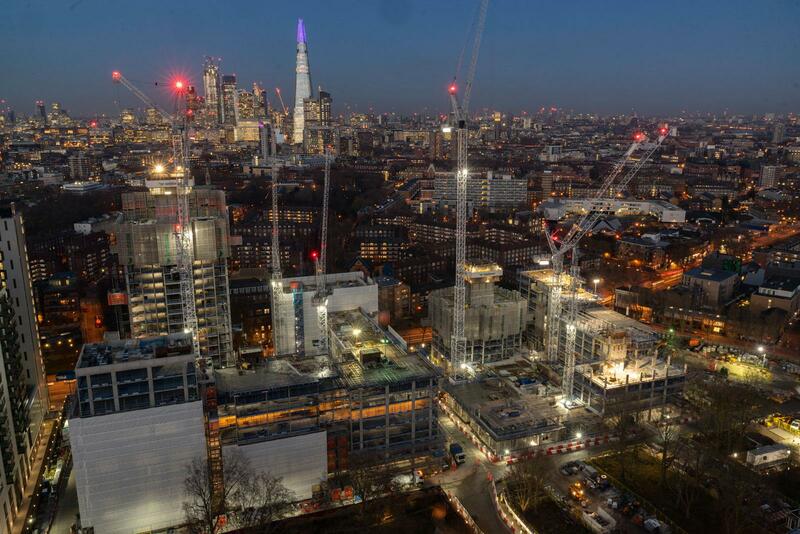 Lendlease has been working in partnership with Southwark Council to deliver a £2.3 billion regeneration project in Elephant & Castle since 2010. DokaXact was used on the buildings H04 and H05 during the MP3 stage. DokaXact is the ideal supplement for Doka climbing- and automatic climbing formwork systems, and an important component for fast and accurate positioning of formwork elements. Thank you for your interest - DokaXact - the formwork positioning system for vertical structures. Thank you very much for your interest - DokaXact - the formwork positioning system for vertical structures.